We engineered the Honda Ridgeline lift kit to fit and work with the truck exactly as Honda intended the Ridgeline to work and play. We manufactured a kit that works with the Ridgeline's award winning design to help you make your truck truly your own! We focused on things that were important to the discriminating customer, Installation is simple, the Traxda Ridgeline kit is designed to go in and out in the same length of time as just replacing the struts and sway bar links. Every Traxda Lift kit is Made in the USA with USA Mill Certified Steel and laser cut to precision tolerances using OEM drawings. Each kit is welded using the latest US Made welders and triple checked to ensure proper fitment. We powder coat every part in-house to make sure the finish lasts as long as your truck does! 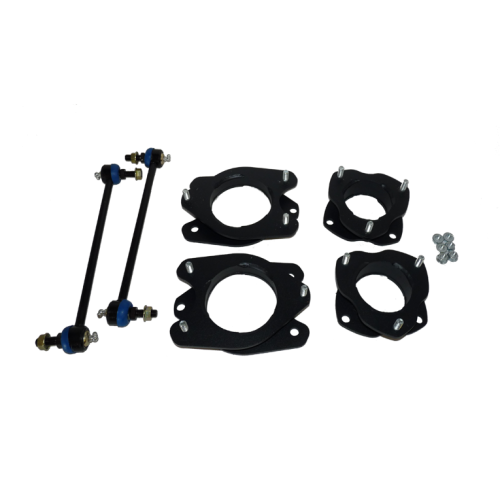 Each kit contains two strut mounts, two rear strut mounts, replacement sway-bar links plus all hardware needed and full color instructions.